Let’s see if I can come up with a post every day of the rest of the offseason. Today, there are 12 days left until Opening Day on April 6. Back into the lightning bolt font, you! Today is a very special day – new episode of Mad Men!! 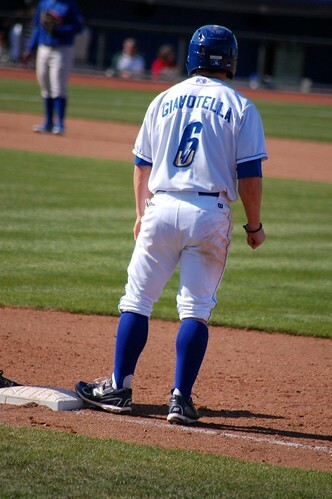 – and I refuse to have it marred (too much) by the fact that Johnny Giavotella was demoted. It’s a little bit comforting that the reasoning given is for his defense. I concede that his defense isn’t perfect. But neither is Yuni’s! OK, I’m still annoyed. So anyway, here are 12 things that have changed about the Royals since the last episode of Mad Men aired on October 17, 2010. 12) David DeJesus was still a Royal…for about three more weeks. 11) The Storm Chasers were still the Omaha Royals. 10) Jeff Francoeur was not a Royal yet. 9) Zack Greinke was still a Royal. 8) Gil Meche had not retired yet. 7) Jason Kendall hadn’t yet taught us how to rewind ourselves. 6) Mike Sweeney was still playing. 5) This blog had not yet introduced (and subsequently abandoned) the Y’Know Meter. (It will return in 12 days!). 4) Salvador “OH MY FORD NOT SALVY” Perez was not a big name yet. 3) Kila Ka’aihue was still being jerked around a part of the Royals organization. 2) Frank White still had a working relationship with the team. 1) I still worked for the Chasers.